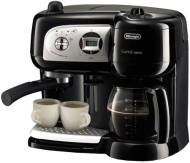 alaTest has collected and analyzed 10 reviews of DeLonghi BCO264B. The average rating for this product is 3.1/5, compared to an average rating of 4.4/5 for other products in the same category for all reviews. Views about the capacity and size are generally positive. The maintenance and usability are also appreciated, whereas some have doubts about the price. We analyzed user and expert ratings, product age and more factors. Compared to other products in the same category the DeLonghi BCO264B is awarded an overall alaScore™ of 78/100 = Good quality. New machine is working great so far, I love this machine, makes a wonderful espresso, and the steaming wand is seet up beauthifully if you just let it do the work and dont mess around with it. Very disappoined with the constant puddles of water. Never leaked coffee, just the water. Found other reviews outside ABT that confirm this - after the fact. I returned the product since it was entirely made of plastic including the steaming wand for capuccino.